Pro-Tec | Pro Chem, Inc.
PRO-TEC is an innovative, metal-crosslink, modified acrylic floor finish product designed for those who do not desire complex and frequent maintenance routines. It is especially designed for light to moderate traffic areas, the combination of polymer technologies in the formula provide an extremely durable finish resistant to wear, scuffing, abrasions and marks. 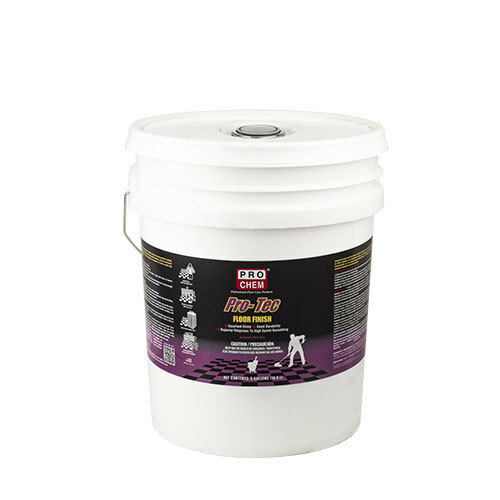 This outstandingly versatile product is capable of protecting resilient vinyl tile and other resilient flooring surfaces. Easy to apply and maintain. It can be maintained with either low speed programs or infrequent (2-3 times per week) high speed burnishing. Thoroughly strip and rinse floors. Next, apply an optional sealer base to worn floors or high traffic floors to improve wear-resistance and enhance gloss. Then apply 2 to 4 finish coats in uniform thin coats, allowing time to dry thoroughly between coats. Allow for longer drying time in damp weather. To maintain, sweep as necessary, then damp mop or scrub lightly with a mild, neutral detergent. Spray buff or buff lightly with appropriate pad. Also excellent for high-speed buffing. In high traffic areas, recoat worn spots as necessary.